In terms of the 2017 average SOL pass rates, Richmond had the second worst schools in Virginia. In that morass of awfulness, the middle schools stood out: Their performance was even worse than awful. Indeed, in 2017 MLK had the worst SOL performance in the state. Some time back I asked the formidable Carol Wolf why the Richmond scores fall into a pit between the fifth and sixth grades. She said the teachers tell her the elementary schools are cheating. Now we hear that there has been an institutional cheating program at Richmond’s Carver Elementary School. 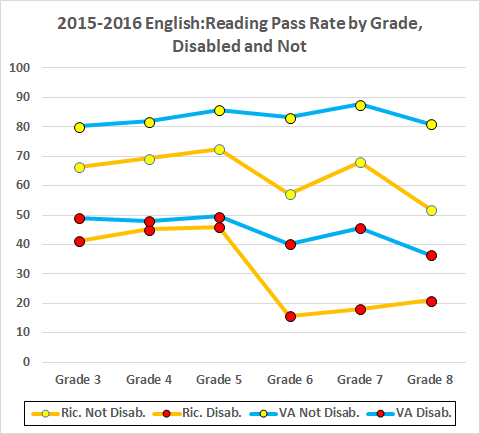 And the data suggest that other elementary schools have been doing the same thing, especially as to the disabled students. The SOL data by grade are consistent with this picture. 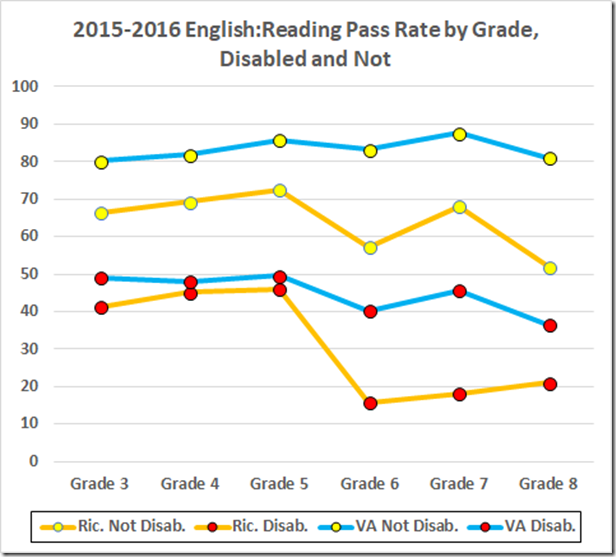 Let’s start with the 2017 Reading pass rates. 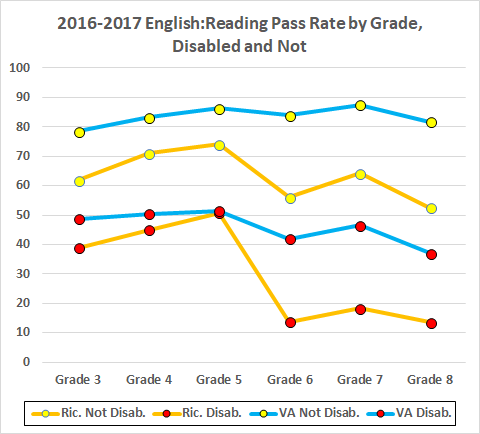 In the elementary grades, we see Richmond’s abled students scoring some fifteen or more points below their peers statewide while the disabled students were closing in on the state average for disabled students. 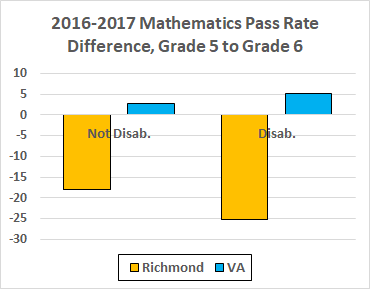 The Richmond pass rates, especially those of the disabled students, plummeted in middle school while the statewide numbers dropped much less. 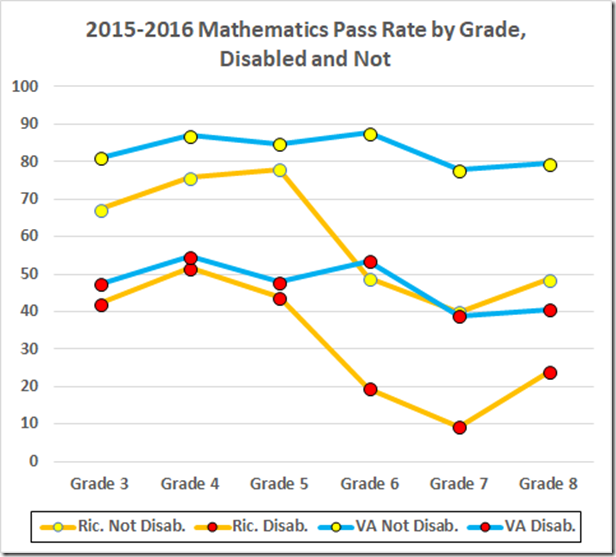 Statewide, as in this case, the pass rates for disabled students have been running about thirty points below the rates for abled students. 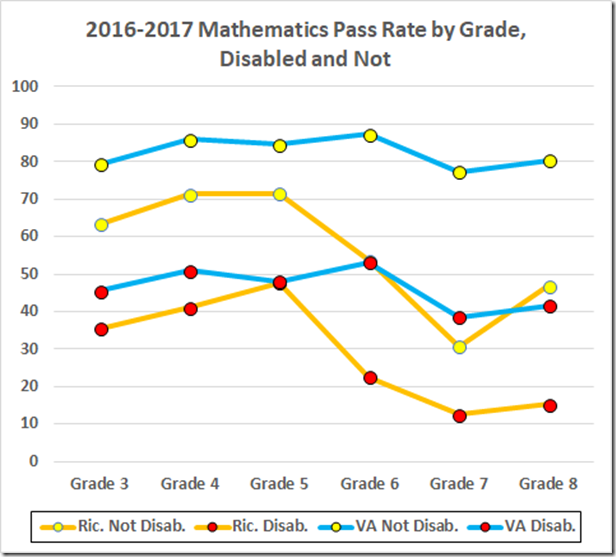 At Carver and elsewhere, we have seen some disabled pass rates near, and sometimes better than, the state average non-disabled rates. 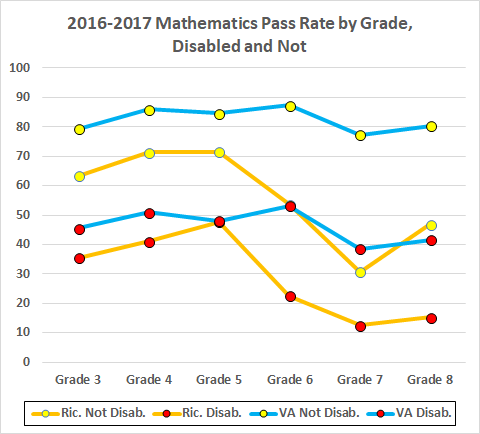 If, as seems probable, Carver’s and some other schools’ numbers are bogus, we would expect the pass rates of the affected students to have tumbled when those students entered the sixth grade and received unenhanced scores. The data here are consistent with that picture, with, as expected, a larger drop for the disabled population. 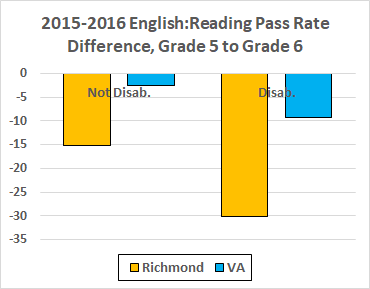 Indeed, these data suggest a whole lot of score boosting in Richmond’s elementary schools. The math data paint much the same picture. 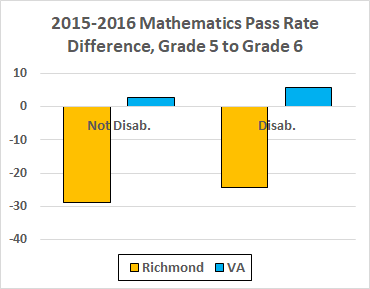 Notice, also, the score decreases continuing into the seventh grade, both in Richmond and in the statewide data. The 2016 data tell much the same story. 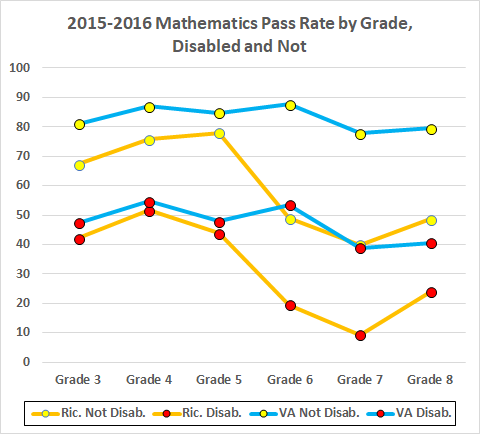 One departure here from the simple view: Richmond’s non-disabled math scores that year dropped more than the disabled. Perhaps there is another factor at work on the math testing. 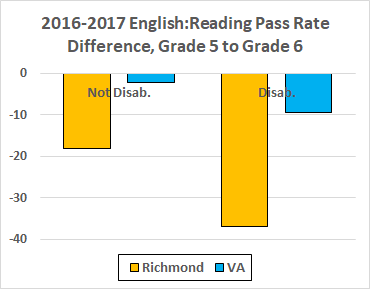 In sum, we can view these data as one more reason to think Carol was right: It looks like they’re cheating in (at least some of) Richmond’s elementary schools. 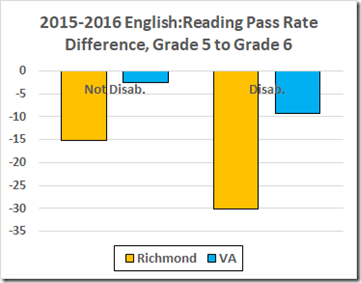 BTW: VDOE has the data to nail this issue. 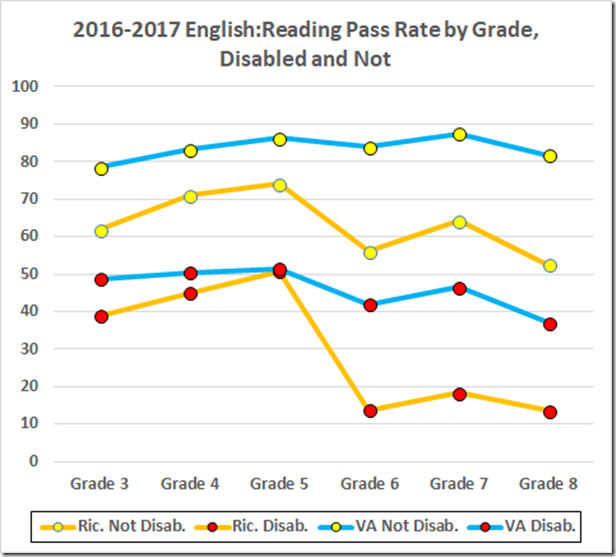 If students entering middle school from some elementary schools show large score decreases while students from others do not, VDOE can identify the elementary schools that may be inflating their pass rates. Silly me. Of course VDOE has not performed, and will not perform, that analysis. Their manifest interest is in high scores and increased graduation rates, not in education. That leaves it up to our new Superintendent. He also has the data and he has an interest in not having a cheating scandal on his watch. We’ll see whether he follows up.